Already the owner of a large property in Villefranche since 1895 (Villa Léopolda), Leopold II became interested in the Saint Jean Cap Ferrat peninsula in 1899. He first of all purchased a small villa close to Passable beach (today known as the Villa Ibéria), with a private port which allowed him to dock his yacht “Clémentine” close by and reach the villa by canoe! Following this, his purchases on the Cap became gigantic. He paid touts to obtain information on pieces of land for sale, and by the use of a proxy, the King negotiated in a ruthless manner to obtain the lowest price. It is important to note that not all the purchases were made under his name, but under companies with names such as “SCI living room” and “Horticole exploration of the Cote d’Azur”, “Domaine of the crown” or even “The independent state of Congo”. Although he had little involvement, he exploited without shame various resources, the main one being rubber. Due to an iron fist and representatives on site with little or no regard of the indigenous life conditions of the workers, the King made an incredible amount of money who allowed him to purchase extravagant properties on the French coast line. A few years later, the Belgian King found himself being the owner of the entire West part of the Cap Ferrat, over 50 hectares of land ( 123 553 acres). It was in 1904 that the sovereign purchased the Villa Pollonnais which was built in the XIX century. The property was redesigned by the Niçois architect Sébastien-Marcel Biasini and occupied by Désiré Pollonnais, the Mayor of Villefranche, from 1874 until his death in 1900. The villa master had received many important guests in his time at the property including the Lord Salisbury, the Grand Duke Pierre from Russia, Prince Charles, the heir to the kingdoms of Norway and Sweden, along with many artists from the Nice opera. For the real estate transaction, Kind Léopold, by means of discretion, used the nominee of his friend and personal doctor Jules Thiriar as a large amount of Saint Jean residents were becoming worried that their territory was slowing becoming under ownership of one man, and along with this, Léopold has the habit of closing his residences with barbed wire, prohibiting locals from walking freely across the land. Following the purchase of Villa Pollonnais and its 15 hectares of land, the King asks his favorite architect, Aaron Messiah to extend the demure. He added onto the West wing of the original building an additional building composed of three levels and completed by a large Corinthian columns peristyle, elevated on a semi circular terrace. Along with this, Messiah increased the volumes of the wing and transformed the campanile (an Italian bell tower) which dominated the building in a gazebos with balusters and arcades with marble columns. The main part of the renovation being over, the façade was reworked with Monochrome paintings and the domain was renamed “Les Cèdres”. At the same time, equally important renovations were being carried out in the interior of the property, where partitions were being removed and precious wood installed on the walls, but it was within the gardens that the most colossal works were being made. Under the orders of the landscapers Harold Peto and Jules Vacherot (the latter being the responsible for the gardens of the Eiffel Tower and the Champs Elysées), a 2km track which allowed the King to go horse riding without being seen. At the same time, a 50m long basin along with an artificial pond built into the rock. Several tonnes of soil was brought in order to plant more olive trees, eucalyptus and palm trees, cedars, date tress and many others. The essence trees soon flowered and lined the pathway with diverse colours; An orangery and a winter garden, a white pergola latticework with worked wood, elevated onto a royal crown, a water garden with successive waterfalls, a replica statue of La Victoire de Samothrace decorated the grounds. Finally a tennis court, horse stalls and pavilions to house the staff were built in to give the property a château aspect. Many of the worlds politicians came to visit the property, notably the French Republic president Armand Fallières in 1909, also Georges Clemenceau who accompanied the prefect of the Alpes-Maritimes, André de Joly. 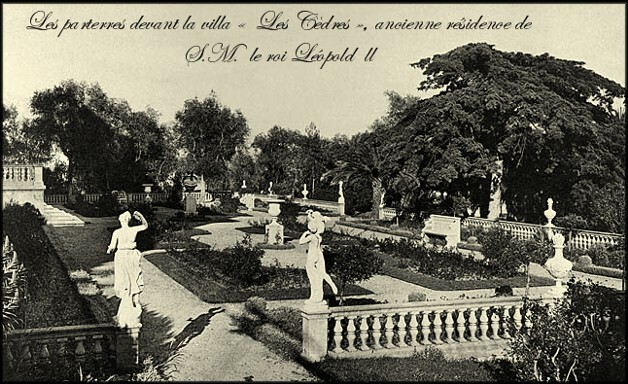 Despite the importance of his possessions on Cap Ferrat, Léopold II continues to purchase land and built houses whenever he could. In 1905 he asks architects Doumet, member of the Institut, and Aaron Messiah to modify a property which is on the beach front at Passable, a villa with an architecture inspired by the pavilion of the Music of Versailles. Finished in less than one year, the villa was named “Le Casin” (meaning small box), and possessed relatively small dimensions and was in fact destined for his mistress Blanche Delacroix, known under the title Baronne de Vaughn. This is where, under the upmost discretion, one of Leopold’s illegitimate sons was born, Julien Delacroix in June 1906. Built in an asymmetric form, the demure has only one floor, and was organised around a vast living room of 100 m² in a octogonal shape with a magnificent painted ceiling, along with marble floors and walls. As per usual, Léopold built a pathway which linked Le Casin to his primary residence along with a large staircase to access Passable beach. How many properties did the Belgian King purchase and renovate to his taste in Nice, Antibes, Villefranche or Cap Ferrat? The figure must be around 10 as the local daily newspaper “Le Petit Niçois” announced in 1909 the construction of “three small houses” reserved for Belgian or French officers use from their return from Congo. Completed by the month of October, the three homes were named Boma, Matadi and Banana, names of three villages situated on the river Congo. At the end of 1909, by the death of the King, signalled the end of his projects, which remained in sovereign boxes and his architects. As for the properties located in Villefranche, the Cap Ferrat villas were recovered by the state of Belgium. As he did with La Léopolda, Albert 1 transformed Les Cèdres into a temporary hospital for the injured soldiers from the First World War in 1915 and Le Casin was used and a place of convalescence for the officers. At the end of the War, both properties were sold individually. Le Casin was purchased by Armand Bernard, a plenipotentiary minister from Stockholm and then the prefect of the Alpes Maritmes, who renamed it “La Radiana“. Note that in 1955, Alfred Hitchcock filmed several scenes from “To Catch a Thief” with Carey Grant and Grace Kelly. Les Cèdres was acquired in 1920 by an English financier and a member of the private council of the British Commonwealth, Sir Ernest Cassel, who sadly died a few months after the purchase. In 1924, following a long period that the property was occupied by heirs, the villa passed into the hands of Alexandre Marnier-Lapostolle, who created in 1880 the famous orange based liqueur Grand Marnier. A botany enthusiast and knowledgeable collector, Alexandre transforms the property into a sumptuous garden containing a wide variety of exotic plants. Following this, his son Julien added to his collection not hesitating to finance shipments on the canopy of the Brazilian forest to install new plants which were sometimes unknown. Please note that this is an article written solely for the history of Villa Les Cèdres and Villa Radiana Saint Jean Cap Ferrat. This is not a real estate listing.